← Happy Birthday Roberto Bolaño! • May 1: Border Town: Crossing the Line by Malín Alegría, author of the popular Estrella’s Quinceañera, focuses on two teenage girls who live in fictional Dos Rios, Texas. The novel is the first in a Sweet Valley High-like series, with more books, such as Quince Clash and Falling Too Fast coming out later this year. 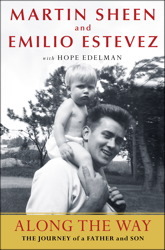 • May 8: Father-and-son actors Martin Sheen and Emilio Estevez will release a joint memoir, Along the Way: The Journey of a Father and Son with Hope Edelman. The book focuses on their faith and includes their thoughts on the making the 2011 movie The Way, about a man’s pilgrimage along the Camino de Santiago in Spain. 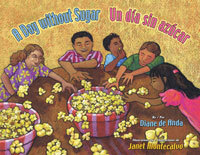 • May 31: Arte Público has several bilingual children’s books coming out, including A Day Without Sugar by Diane Deanda, Sofía and the Purple Dress by Diane Gonzales Bertrand and Alicia’s Fruity Drinks by Lupe Ruiz-Flores.